A review in 10 words (or thereabouts): Jasper Dent really hopes the acorn fell far, far, FAR from the tree. Jasper Dent is the son of a legacy, a terrible, horrible legacy that will stay with him for the rest of his life. His father is the most notorious serial killer in history. Now living the rest of his life in jail, Billy Dent left quite the imprint on his young son. Jasper is terrified that "serial killer" is hereditary, and he spends every minute of every day reminding himself that people matter. 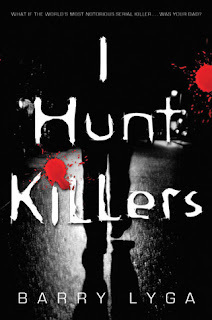 When a new killer emerges in the small town, Jasper is determined to prove that he can use his "talents" for good and avoid the fate his father dealt him, but is there just too much Billy Dent in him to walk the straight and narrow? Gruesome. And scary. And disturbing. And terrifying. If I could readily think of more synonyms, I would use them. Think Hannibal meets Criminal Minds. Lyga has created a psychological thriller with just enough gore that you don't want to read at night. At first I was a bit annoyed with Jasper. Alright already. I know you're afraid of becoming your father. We get it. I think you keep harping on it just to get attention (a la Harry Potter in Order of the Phoenix). But then I realized that it really allowed you to get into Jasper's head, to understand the mind games that Billy was still playing on him, even from behind bars. So the not so awesome was a little more awesome by the end of the book. Do you ever see the episode of friends where Joey tells Rachel about putting scary books in the freezer when he gets upset? I was totally considering putting I Hunt Killers right next to my chicken rings in the freezer. This book put me a bit on edge. And I LOVED it. My first Barry Lyga experience, and I will be checking out his other titles as soon as time allows. The story is a fast-paced thrill ride moral depravity and the battle of nature vs. nurture. Read it. You won't be sorry!